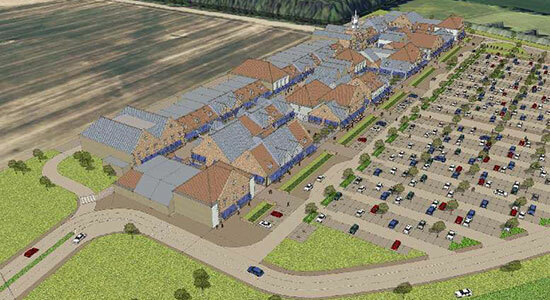 We have been working for the developer on an exciting new designer outlet village at Scotch Corner. Our work has involved preparing the Transport Assessment for the planning application, assessing in detail the traffic effect of the development on local roads and the strategic network maintained by Highways England where the A1 is being upgraded to motorway status. We have worked closely with both North Yorkshire County Council and Highways England to agree new and improved bus service routes and prepared and agreed the Car Park Management Plan and a Travel Plan for the site. This is included in agreed planning conditions and a S106 Agreement. Highway improvements for vehicle users and pedestrians and cyclists were agreed. Our design team has been responsible for preparing the site access and off-site highway improvement designs. Richmondshire District Council resolved to grant planning permission in 4 months after submission in January 2016. However the Secretary of State ‘called in’ the proposals for review. In May 2016 PEP provided expert transport evidence at the ‘call in’ inquiry and the proposals were granted permission in December 2016. The development is now in the detailed design stage and PEP is continuing to assist the developer to discharge planning conditions and working in conjunction with North Yorkshire County Council and Highways England to agree the S278 highway works. The scheme is due to open in spring 2019.